We love hearing stories and seeing pictures of your real-life weddings and how you incorporated Clemson tradition into your big day. Meet Clemson alum Rachel Wolf. 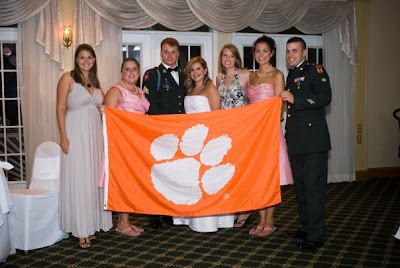 She got married way up north in New Jersey, but that didn't stop her from including Clemson in her wedding. 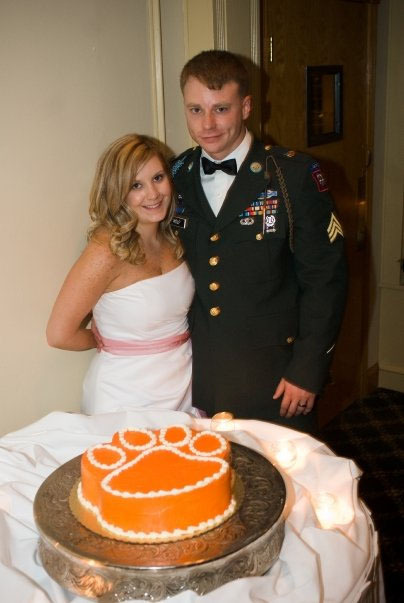 Here are two photos she shared with us of her and her husband John with their tiger paw groom's cake and a picture of the Clemson alum wedding guests doing the traditional Clemson flag pose. Thanks for sharing Rachel... you can read more about her on her blog Observations of a Token Yankee. She's the newest addition to my ever-growing list of blog reads - her blog is great! "When my husband (a Univ. of Arizona Grad, and Marine Officer) and I married, we got married in my grandparents church in Central, I wore my mother's wedding dress, and had a lovely reception at the recently closed Liberty Hall Inn in Pendleton. After the reception, we did not want anyone to know that we were staying at Liberty Hall, so we needed to 'drive off' and waste a little time while everyone cleared out.. I decided we should head to where else, Tiger Town Tavern. We headed in , me in my wedding gown, and he in his white Marine Officer Dress uniform...and we had a great time, we danced , we were toasted and given a bottle of the best champagne TTT had...Ha! It was a special part of our wedding that has been a favorite story to tell. We celebrated 20 years this summer." Tiger Town Tavern serves champagne?? Who would've thought! :) Congrats on 20 years Carolina!! Do you have wedding photos or stories you'd like to share? We would love to feature you in one of our upcoming Wedding Wednesday posts! Email us! !